Autosomal recessive spastic ataxia of Charlevoix-Saguenay (ARSACS) is a neurodegenerative disorder characterized by late infantile onset spastic ataxia and other neurological features. Initially described in the Charlevoix-Saguenay region of Quebec, Canada, it is being increasingly reported from many other countries. Here, we present the case of a 20-year-old male from South India, who presented with progressive ataxia, spasticity, and peripheral neuropathy with imaging features and genetic testing suggestive of SACS gene-related ARSACS. The phenotypic variability from other cases and occurrence in a geographically distinct region is stressed upon to alert the clinicians to consider ARSACS in progressive ataxias. Autosomal recessive spastic ataxia of Charlevoix-Saguenay (ARSACS) is a neurodegenerative disorder characterized by late infantile onset spastic ataxia and other neurological features. Since 1978, when it was initially described in the Charlevoix-Saguenay region of Quebec, Canada, by Bouchard et al., it is being increasingly reported from many countries outside Canada including Japan, Italy, and Brazil.,,, The chromosomal locus for ARSACS was identified on chromosome 13q11 (the SACS gene) in the Quebec kindred. Mutations in SACS gene responsible for the production of abnormal truncated protein sacsin have been reported in cases from Canada, Italy, and Turkey, although the exact proportion of SACS gene mutation in ARSACS is unknown. To date, genetically proven ARSACS has not been reported from the Indian subcontinent, although a case has been reported with the typical clinical features. A 20-year-old male from a coastal district in Southern India, a graduate in humanities, presented with a history of difficulty in walking since the age of 5 years. He was the first child born to nonconsanguineous parents, with a birth weight of 2.8 kg, with normal antenatal and postnatal history. He was noted to have developmental delay predominantly in gross motor and language spheres. He attained head control by 8 months and started walking without support by 2 years of age. Speech delay was noted in the form of monosyllables at 2 years of age and speaking two words with meaning at 3½ years of age. Around the age of 5 years, he was noticed to have recurrent falls on minor contact with fellow students. His parents also noticed that he was swaying toward either side while walking on uneven surfaces. His symptoms were slowly progressive over time. He also had tremulousness on reaching out to hold a glass of water, and smeared his face while he ate. He used to drop objects occasionally from his hands, and had a history of slippage of footwear with awareness. His teachers noticed his handwriting to be illegible, so he wrote his board examination with the help of a scribe. Within the course of 5 years, he developed difficulty in making a bolus of food, buttoning his shirt, and lifting heavy objects. There was no history of dragging of feet or tripping. There was no history of difficulty in getting up from squatting. He was also noticed to have decreased social interaction and violent outbursts, around 5 months prior to evaluation. His past medical history was unremarkable except for a history of fever with rash at the age of 3 years. He had normal bowel and bladder habits and used to take a mixed diet. He had received Vitamin E supplementation in the past. On general physical examination, he was thin built and was noted to have high-arched palate, long slender fingers, and hypertelorism. He was right-handed and had a mini-mental status examination score of 30/30. His language function was normal except for an illegible handwriting. He had a visual acuity of 6/12 of both eyes, a normal optic fundus. Gaze-evoked horizontal jerky nystagmus and rebound nystagmus, with saccadic hypermetria, was noted. Rest of the cranial nerves were normal. He had small muscle wasting of upper and lower limbs. Upper and lower limb power was Medical Research Council grade 5/5 except small muscles of hand and intrinsic foot muscles, which were weak. Superficial reflexes were normal and plantar reflex was bilaterally flexor. Deep tendon reflexes were brisk except for bilaterally absent ankle jerk. He had cerebellar signs in the form of bilateral finger-to-nose and heel–knee incoordination, dysdiadokokinesis, and past pointing. He had a wide-based gait with difficulty in turning and swaying while walking. Tandem walking was impaired and nodding movements of head were noted occasionally. Sensory system was normal and there was no peripheral nerve thickening. The inheritance of hereditary ataxias can be as autosomal dominant, autosomal recessive, X-linked, or mitochondrial. The biggest hurdle to an accurate diagnosis has been genetic testing which over the past decade has become widely available for many of the ataxias. The variation in the severity of phenotypes and the differing age of onset also cause difficulties in diagnosis. Our patient had typical MRI findings, but lacked retinal striations and was found to be intellectually normal. The increasing number of cases being reported from different parts of the world with variable phenotypes must alert the clinician to suspect ARSACS in cases presenting with spastic ataxia and linear pontine hypointensities on MRI. The original Quebec kindred had 13q11 chromosomal locus (SACS) mutations responsible for ARSACS. The SACS gene-encoded sacsin protein and its significance is still under evaluation. Several types of mutations were reported from regions other than Canada, most resulting in truncated forms of sacsin protein. Our patient had SACS gene mutation responsible for ARSACS. The proportion of patients with SACS gene-related ARSACS is not known owing to the lack of genetic testing confirmation in the majority of patients. As genetic testing becomes widely available, the reason for phenotypic variation, differences in age of onset, and the other genes (if present) responsible for ARSACS may be clearly elucidated. Bouchard JP, Barbeau A, Bouchard R, Bouchard RW. Autosomal recessive spastic ataxia of Charlevoix-Saguenay. Can J Neurol Sci 1978;5:61-9. Ogawa T, Takiyama Y, Sakoe K, Mori K, Namekawa M, Shimazaki H, et al. Identification of a SACS gene missense mutation in ARSACS. Neurology 2004;62:107-9. Criscuolo C, Banfi S, Orio M, Gasparini P, Monticelli A, Scarano V, et al. A novel mutation in SACS gene in a family from Southern Italy. Neurology 2004;62:100-2. Pedroso JL, Braga-Neto P, Abrahão A, Rivero RL, Abdalla C, Abdala N, et al. Autosomal recessive spastic ataxia of Charlevoix-Saguenay (ARSACS): Typical clinical and neuroimaging features in a Brazilian family. Arq Neuropsiquiatr 2011;69:288-91. Richter A, Rioux JD, Bouchard JP, Mercier J, Mathieu J, Ge B, et al. Location score and haplotype analyses of the locus for autosomal recessive spastic ataxia of Charlevoix-Saguenay, in chromosome region 13q11. Am J Hum Genet 1999;64:768-75. Pandi S, Deshpande A, Khardenavis S. Case report of autosomal recessive spastic ataxia of Charlevoix-Saguenay. J Mahatma Gandhi Inst Med Sci 2014;19:62-4. 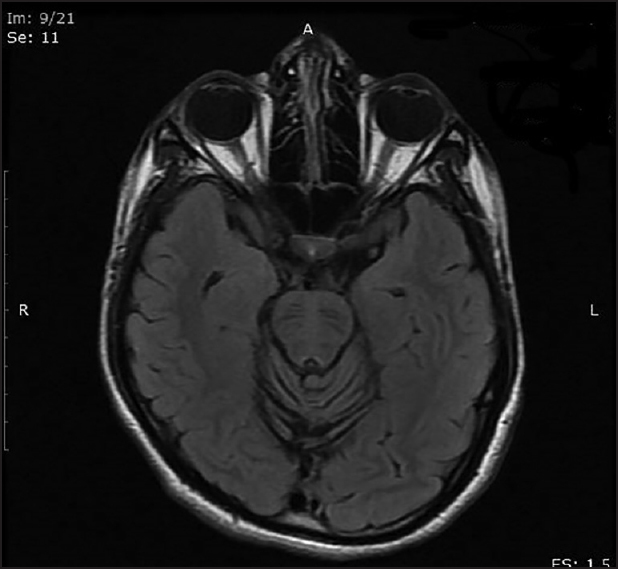 Martin MH, Bouchard JP, Sylvain M, St-Onge O, Truchon S. Autosomal recessive spastic ataxia of Charlevoix-Saguenay: A report of MR imaging in 5 patients. AJNR Am J Neuroradiol 2007;28:1606-8. Engert JC, Bérubé P, Mercier J, Doré C, Lepage P, Ge B, et al. ARSACS, a spastic ataxia common in Northeastern Québec, is caused by mutations in a new gene encoding an 11.5-kb ORF. Nat Genet 2000;24:120-5.